Marshall M. Fredericks Sculpture Museum | Sketch for "Henry Ford Memorial"
The idea to create a memorial honoring Henry Ford took root in 1948 when the Dearborn, Michigan Chamber of Commerce conducted a poll of Dearborn residents and learned that most of the populace favored such a proposal. The Dearborn Chamber of Commerce initiated a fundraising drive to finance a life-size full-length bronze of the auto magnate and commissioned Marshall Fredericks to design the sculpture. Fredericks’ original model for the memorial consisted of a sixty-year-old Henry Ford standing with one hand on the shoulder of a teenage boy and the other hand pointing towards the future. Although approved by the Ford family, Fredericks never executed the design, as fundraising proved to be difficult, causing the project to be put on hold. In 1967, almost twenty years after the original proposal, the Inter-Service Club Council of Dearborn revived the project, calling upon residents of the city to raise funds for the monument through public subscription. Unfortunately many Dearborn residents thought that the teenage boy in the model was Edsel Ford, Henry Ford’s son, and not a representation of Henry Ford in his youth, as the artist intended. Although a historically inaccurate assumption, the confusion persisted, causing the Henry Ford Statue Committee to scrap the original concept in favor of a new design. Located at the Henry Ford Centennial Library, the final memorial is a life-size bronze figure of Henry Ford in his familiar pose, standing with his hands in his pockets, situated at the center of a serpentine marble wall. At the memorial’s unveiling in 1975, Fredericks remarked “This pose, the thoughtful look, represents him in the best way. I like to see him thinking.” Intended to tell the story of Ford’s life, bronze reliefs depicting his early childhood, adolescence and the growth of the Ford Empire accompany the central figure. The reverse side of the memorial features three engraved quotations attributed to this legendary innovator. 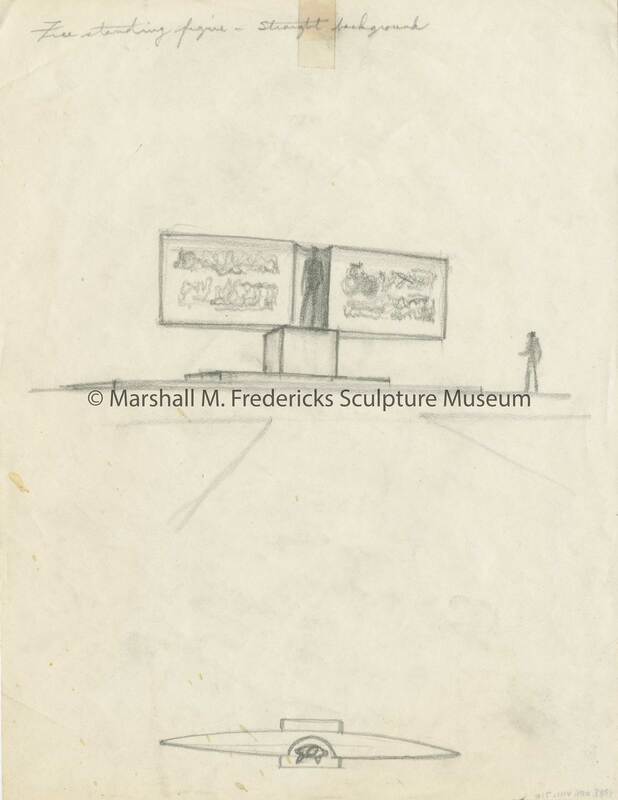 Fredericks, Marshall M., 1908-1998 , “Sketch for "Henry Ford Memorial",” Marshall M. Fredericks Sculpture Museum, accessed April 21, 2019, http://omeka.svsu.edu/items/show/6763.